Lack of transparency conceals hidden moving costs! The move of household goods represents a significant portion of your relocation costs. When was the last time you looked, really looked, at your moving costs to determine if you are receiving the best value for you and your relocating employees? The best method of reducing moving costs, without compromising service, is by having your own contract with a moving company rather than obtaining moving services through your relocation service provider. Although relocation companies will tell you that they are able to obtain better moving tariffs than you can obtain directly because they bundle volume and negotiate best price/quality, our analyses have consistently shown that the opposite is true. Intuitively one would think that the volume of moves initiated by relocation companies would result in volume discounts. However, the relocation company tariffs, and consequently the moving costs you pay if your moves are part of their supplier network are actually higher than current market rates. 2. 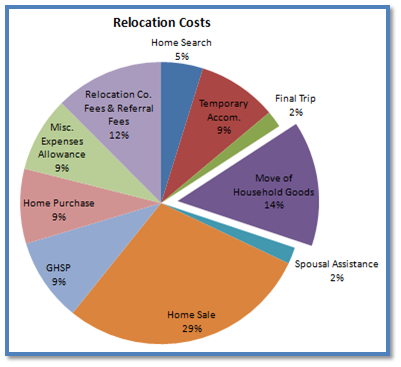 Referral fees from 8% to 20% are paid to the relocation company. On a $10,000 move, that is equivalent to $800 – $2000, instead of a move management fee (ranging from $250 to $450) that would otherwise be charged to you, the corporation. 3. Audit fees are charged by the relocation company to the mover ranging from $150 to $200 per move. 4. Network fees that are charged as a monthly/annual fee to gain access to your business. Network fees are payments paid directly to the relocation company and are disguised as costs to set the moving company up in their system. 5. There is no incentive for the relocation company to properly audit and reduce the overall cost of the move because their revenue is based on a percentage of the moving invoice, i.e. the higher the invoice, the higher the referral fee. In fact you could say there is a built-in incentive to balloon or pad the moving invoice within both the mover and relocation company. 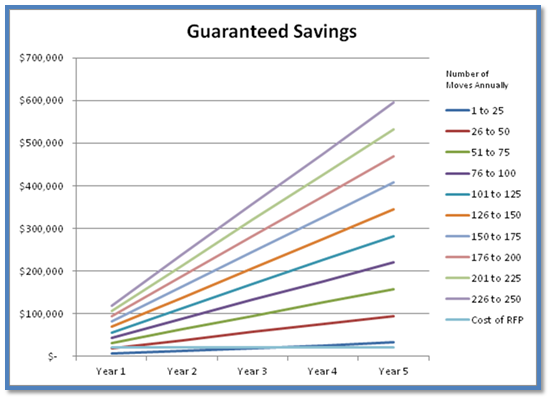 As shown by the graph below, savings far exceed the cost of conducting an RFP. The greater the number of moves per year, the higher the savings as compared to the cost of undertaking an RFP. 2. Reduce referral fee opportunities to direct more revenue to drivers/packers. 3. Supplier more engaged and willing to go extra mile. 4. Single Point of Contact (SPOC) for employee will be maintained through the relocation company counsellor, who will contact the mover and if any, handle issues and assist the employee with claims resolution. When a mover agrees to a self haul they are in total control of the move which results in higher level of service. On the other hand, handling your employee moves through a relocation company supplier system where the next empty truck gets your move is like entering a lottery. You could receive a driver, packer/unpacker that meets the minimum standards vs. a hand-picked crew with outstanding service qualifications. Loss and damage can tarnish the best of moves. Breaking something that is irreplaceable can be catastrophic for a family, so ensuring the best companies service your moves is paramount. If you are committed to a single or a few movers, they are more likely to care more as they want your confidence and future business. In the relocation company environment, movers care less about pleasing you and cater towards the relocation company that hands the moves out. We have concrete data as a result of our independent Relocation Service Quality Survey that indicates that employee satisfaction is enhanced by having direct mover contracts. We can share data with you showing the performance of various models of how to select moving suppliers. Lower cost with the elimination of referral fees and higher satisfaction rates as the suppliers are more engaged to your relocation program.